For January to June, see the previous post. Having already been to the Lakes four times in the year, a record for me, I deliberately switched my attention elsewhere, and resumed my assault on the Cambrian Way. Just as the first time, my plan was a little too ambitious and I so burnt myself out that I stopped at Llandovery. The Cambrian Way has now turned into a multi-year project and I’ll have to finish it off in sections. The Cambrian Way also coincided with me reaching a state of equilibrium in my gear, with a feeling that all of the big issues have been resolved and that I’d honed my kit to a core set that just required the odd tweak depending on the particular trip or the conditions. I invested heavily in gear this year, starting the year with a new winter sleeping bag (Cumulus Prime 700) and a big order of Chocolate Fish garments due to imminent discontinuation of certain lines. In May, after trying really hard to make myself love the ULA Epic backpack I bought last year, I finally gave up and bought myself a Gossamer Gear Mariposa, which has been superlative – so much so that it has enabled me to retire two packs and has quickly become my goto pack for any longer trip. With the promise of extensive walking over the summer, various bits of fine-tuning to my packing system and accessories happened in the weeks leading up to my break and the final piece fell into place when I bought a Honey Stove from backpackinglight. I took this to Wales with me, and it has now effectively replaced my trusty Trangia (you know, the Stove I said I could never part with), to the extent that I no feel I could ditch the Trangia and not miss it. For this reason alone, the Honey Stove is my New Gear of the Year. The other big thing in July was the family holiday in Austria where I did a few walks – nothing elaborate as it was a family holiday, but I did climb a couple of mountains and we visited the tops of a couple more by cable car. In between all of this I managed to fit in another section of the LOOP, and attended a series of art classes to address weaker area in my repertoire. Deep into the school holidays and not expecting to get out solo that much other than for day walks, I somehow managed a trip to the Lakes, that had been earmarked to finish the Cambrian Way, and failure on which led me to change the plan. So I headed for Patterdale to finish the Eastern Fells. This trip was a nice balance of hostelling and wild camping, enabled me to pick off the remaining stragglers and also to revisit some fells I’d not been to for years. Memorable camps on Calfhow Pike and Great Mell Fell sealed that trip. I didn’t do many new Wainwrights this year, but one of the fells on this trip quickly became a favourite. This trip was my second visit to Great Mell Fell, and I’d felt I needed to come back to do this one carless and solo for the integrity of my round. But I was also itching to come back for a camp. It was a bit too breezy for a summit camp so I dropped down a little way for some shelter and endured a slopey pitch. Great Mell Fell is my new fell of the year. The trip ended with me doing a dawn walk out to the bus stop to get an early train, Cath having decided not to join me for our planned second phase in the Northern Fells, and me happy to quit while I was ahead and before the weather turned really nasty. For the rest of August I largely lurked around home, but did get out for 3 more sections of the LOOP (sections 6, 7 and 8), and a trip to Richmond Park for a free Nordic Walking lesson with @Hikerciser that I somehow won in a draw on Twitter. In September I had two bites at the South West Coast Path, first taking advantage of a family camping holiday to fill in the section between Seatown and Lyme Regis that Dad and I bailed out of in 2009. Dad and I then rocked up in Cornwall later that month to do the section between Falmouth and Penzance. One more section of the LOOP put me within striking distance of getting it done in under a year. 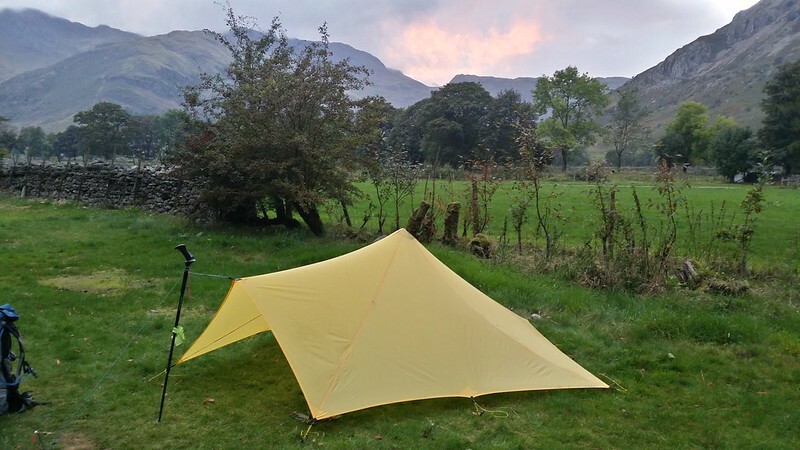 The end of the month saw me back in the Lakes for what felt like my most adventurous trip there – taking my new Trailstar out for the first time. It was memorable with my first night on Glaramara at a long-coveted spot, followed by a wild day and night camped in upper Eskdale. I found the limits of what I’m prepared to put up with on this trip, and as a result the Trailstar is up for sale and I’ve invested in a mid – which is much more to my liking. Cath met me a few days into the trip and we walked back from Eskdale via Wasdale to Langdale, with a couple of nights at campsites and one wild camp at Styhead Tarn. This gave the opportunity to revisit the Burnmoor Tarn area which I’d enjoyed on my winter trip in 2013, and to introduce Cath to some places a little further off the beaten track. 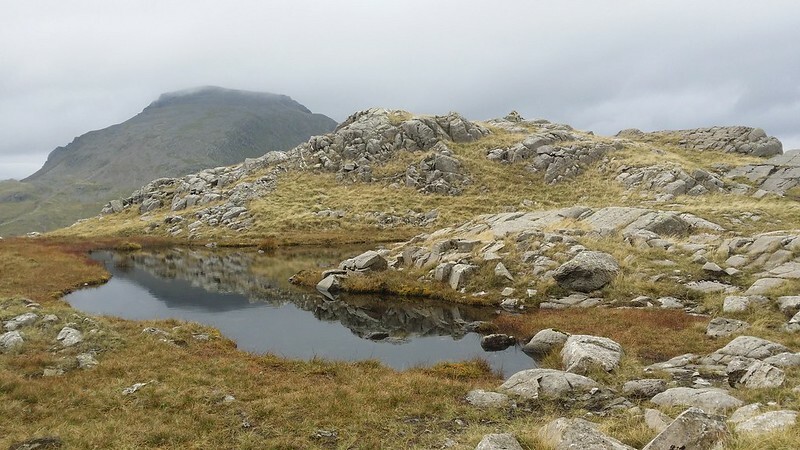 The last day culminated in a full hour and a half’s exploration of Seathwaite Fell, my favourite fell, and a chance to try to find the myriad of small tarns nestled amongst the outcrops that make it so interesting. We then headed down to the campsite (thanks to @JillySherlock for the tip as to where to pitch for the best view). October was all about finishing the London LOOP and three daywalks achieved this goal (sections 10, 11 and 12). I capped the month with an overnight backpack from the end point of the LOOP in Erith to the start of my next project, The Saxon Shore Way, in Gravesend. This was also an opportunity to try out the new Hexpeak that I bought to replace the Trailstar. 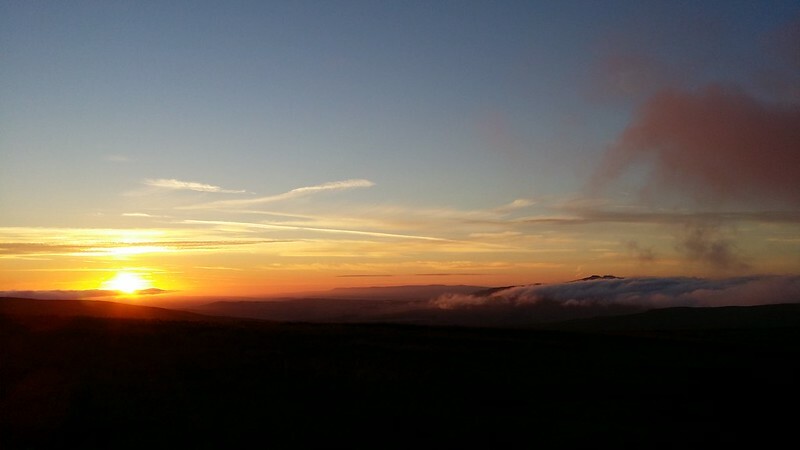 November came and the opportunity to do some walking on Dartmoor arose. I jumped at it, and the 8 of us had a cracking time. So much so, that I’m going again very soon, and hope to get down there at least once a year, if not more. With my Wainwright round drawing to a close, a new obsession with the 400 or so tors and rocks of Dartmoor seems to be taking over. A final trip to the Lakes beckoned as some stragglers of fells were annoying me. I was lucky to catch a decent few days when the autumn colours were at their height. A very low number of new fells visited but more than made up by the views and the opportunity to meet up with friends. A week later I was back for a purely social occasion – Gina’s Christmas do. Even though the nearest I got to a fell was walking around Grasmere and looking at the paintings of hills in the art shops, this was well worth the 10 hour round trip. Expect to see a lot more where this came from in 2015. All in all, it’s been a very full year. Here’s a summary of the highlights and awards again…. Beer of the year – Innis & Gunn Rum Finish (a legacy of Edinburgh). Now about that Blog Award thing…. Here, I’ve deliberately steered clear of using the term “best”, and I mean solely to award the blog I’ve enjoyed most this year. This isn’t necessarily my long-term favourite or even the “best”. There are some great bloggers out there, but I tend to steer clear of the “big names”, finding many of their posts far less inspiring than those of many lesser-known bloggers. For me, a good outdoors blog is heavy on trip reports, its gear reviews are thorough and show evidence of sustained use of the item being tested and moreover of the sort of gear that I would use. But through it all, the best blogs I read are those that convey the sheer joy of being in the outdoors. Long-term favourites include Martin Black, whose more everyday lowland escapades in East Anglia inspire me to create adventure out of the meagre offerings in this part of the country; Blogpackinglight as a goto source for gear modifications and which was instrumental in the final decision to buy my Scarp1 a few years ago; Lonewalker, who is both a friend and the first blog I ever followed; I enjoy the all-too-few posts of my friend Cath who started her blog last year, and through her posts relive the discovery of these magical outdoor places; I always enjoy posts on the Pieblog and blogs by Messrs Sloman and Rye. I’ve also enjoyed following Pete Hill’s progress on his 5,000 mile walk around the coastline of the UK; happy to see Paul Byrne has started blogging, beginning with his excellent series of posts on his trip to Nepal; found in Rob Pollard someone who is as obsessive a planner as I am; and discovered Paul Shorrock, in particular a couple of posts about the Berwyns which I’ve had my eye on for a while. But for me there are two blogs which have stood out this year. The first of these is One Swedish Summer by Mark Waring, chronicling lengthy adventures in Scandinavia. Why this blog didn’t even get shortlisted for any of the awards is utterly beyond me. The other standout blog this year is, of course, James Boulter’s Backpackingbongos blog. James, too, went on a backpack in Sweden and it’s that series of posts I felt particularly drawn to this year. I found it easier to relate to James’s posts than Mark’s as something I might contemplate doing, and that’s why it’s my blog of the year. This one has at least been shortlisted for blog awards this year, and rightly so. I know there are many who agree with me that this would have been a much worthier winner of certain awards than those that did win. That’s all I’m going to say on the subject. 14 wild camps, 12 tame camps and 16 nights spent in various hostels and bunkhouses. 67 Wainwrights visited, of which 13 were new. 1 long distance path completed and progress made along another. Not to overlook the fantastic walking that I have locally. It doesn’t matter whether you do a long distance path in one or in several chunks as long as you enjoy what you’re doing. It’s possible to get an outdoors fix even in a big city. Scottish beer is really rather good. I’m not a bivvy or tarp sort of guy. I’m a complete idiot for overlooking Dartmoor for so many years. Blog awards are to be avoided. Really nice to read your Ploddies 😉 already looking forward to your adventures in 2015. Happy holidays !! !